I’ve been using and am a loyal fan of First Aid Beauty’s daily cleansing wash, which came at a moderate price point and has provided months of use sans any breakouts, so I was eager to try out other products from the brand. Another product bestseller for the line is the Ultra Repair Intense Hydration Cream, which can be used to hydrate the skin on a daily basis, and has the additional benefit of providing relief for itchy skin, redness and irritation, and even soothes topical conditions, such as eczema. The product is cruelty-free, and formulated without any parabens, sulfates, artificial fragrances, dyes, or phthalates. All of the ingredients in the creams formulation are suitable for any skin type, including very sensitive skin, and allergic reaction or breakout following use is extremely rare. While I do not suffer from a specific topical condition, the cream offers the additional benefit of treating varying ailments, including eczema, rosacea, psoriasis, and dermatitis. It’s nice to see a product suitable for sensitive skin and helpful in treating common topical conditions, as while many products on the market are formulated for sensitive or breakout prone skin, the topical condition treatment category is often lacking or not effective. With continual daily use, I really enjoyed visible benefits more quickly than I had anticipated. Hydration was restored within days, and my skin was more radiant, and felt soft and nourished. The cream caused no allergy, breakouts, or redness, even with very sensitive skin that tends to be highly reactive to varying ingredients. All of the ingredients in the formulation are naturally based, and designed to treat any redness, irritation, itchiness, and tackle topical conditions, alleviating dry patches and redness. The price point is extremely modest for the luxury beauty category, and the product offers longevity, as only conservative application is required. I would certainly recommend this cream to anyone with highly sensitive skin, very dry skin, and those seeking treatment for varying topical conditions. I recommended the cream to a friend following use who suffers from eczema and rosacea and typically breaks out or experiences irritation using any product that’s outside of a prescriptive treatment, and she praised the benefits to use and noticed visible improvements with use. This review will cover some main product features, positives and negatives, as well as some of the main ingredients in the formulation and benefits to use. 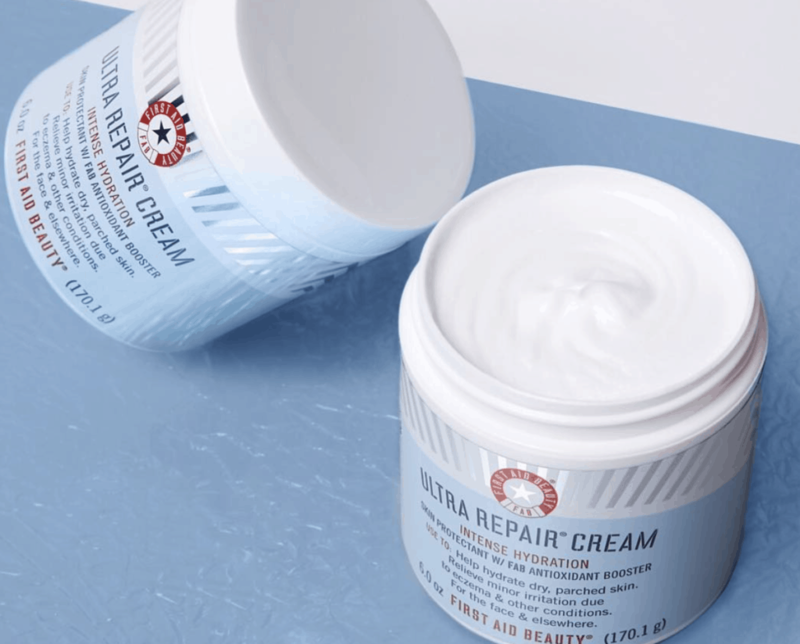 First Aid Beauty’s Ultra Repair Cream Intense Hydration is an all-over moisturizer for daily use that can be used on the face or body. The soft, whipped texture is highly absorbing and does not feel greasy, sticky or heavy, or leave any residue behind following use. It is formulated with sensitive skin and topical conditions in mind, and free of any irritating agents or chemical additives. The product is so gentle and soothing it can be used on children and babies, which may help assuage fears in those prone to breakouts or with extremely sensitive skin types. The moisturizer leaves skin looking radiant, and feeling smooth, hydrated, and nourished immediately following use. Results including restored hydration are almost immediate and noticed directly following use, with more improvements in the following days with continual daily use. It can be paired with any cleanser and seems to work well with the First Aid Beauty cleanser, which is also suitable for sensitive skin and never breaks me out or feels irritating. The moisturizer is perfect for combating dry, scaly, skin, or treating rough patches on the face or body. It has anti-aging benefits including improvements in the appearance of fine lines and wrinkles, so it’s also suitable for any age or those concerned with reversing signs of aging. It protects the skin from free radical damage and sun damage, by forming a protective barrier on the surface layer. Formulated with colloidal oatmeal, Shea butter, allantoin, and ceramides, all of the ingredients are safe and natural, perfect for sensitive skin, and work in the treatment of different topical conditions. While I did not personally experience any negative issues, concerns or skin reactions, allergy is always possible with any topical use product or treatment. First Aid Beauty has a strong return and exchange policy that honors full refunds upon dissatisfaction or allergy, and this policy favors the new and returning consumers. If you are dissatisfied with the use of the product, or if it does not work for your skin to provide suitable anti-aging benefits, or you experience any product allergy or reaction to the formulation, you may elect to return it at any time. In this case, you will receive a full refund equal to the entire purchase price of the item. It is important to note that the ingredients in this formulation are very suitable for even the most sensitive skin, and designed to improve breakouts as well as topical skin conditions, however allergy is possible with any product. I would highly recommend this product for anyone seeking a treatment for topical conditions or if you simply have very sensitive or dry skin. It’s become my daily go-to moisturizer, and it restores radiance and hydration without causing any irritation or breakouts. It’s great to see a company tailor products to treat a likely smaller subset of consumers, and remain mindful of different skin conditions that due effect many. The formulation is so gentle it can be used on babies or children, but does offer anti-aging benefits and aesthetic improvements as well when used by adults as a daily moisturizer. I appreciate that the company is cruelty-free and free of any damaging or irritating ingredients, and at $30 for months of use, it is surely a luxury beauty product that exceeds competitor products at higher price points, without breaking the bank. I also felt no need to use any serums or heavy oils when using the First Aid Beauty cleanser and moisturizer, as adequate hydration was provided. Recommended!